AMORPHIS “Queen Of Time” enters charts worldwide! »Queen Of Time« (Nuclear Blast), the latest offering of melancholic progressive metallersAMORPHIS entered the charts worldwide, including #1 in Finland! 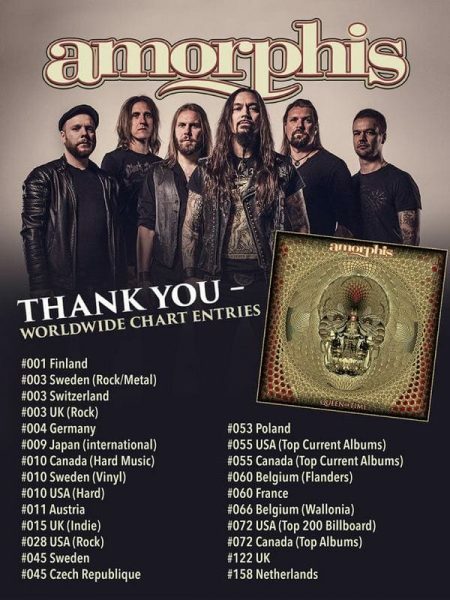 In Germany, Finland, France, Switzerland, UK and USA they even improved their chart result of the precursor »Under The Red Cloud« and in almost every country they had the best ever AMORPHIS chart entry! “Unbelievable to have such an amazing chart entries. Despite the fact that most critics love »Queen Of Time«, it‘s not obvious that the album is going to sell well, specially at year 2018. Like we‘ve told before, we have the most lovable and loyal fans in the whole universe. Humble THANK YOU to every single person who has bought, streamed or otherwise grabbed »Queen Of Time«. We put all our sweat and tears into this album so you better believe that the great success of »Queen Of Time« feels amazing! !” comments Esa Holopainen. AMORPHIS “Queen Of Time” enters German charts at #4! 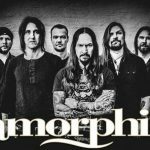 First track from upcoming Amorphis album played by Finnish Radio Rock! Lyric video to “The Bee” from Amorphis upcoming album is out now!